* High pressure decorative laminate (HPL) surface is manufactured to BS/EN438/2005 and is inherently heat, impact, moisture, ultraviolet and wear resistant. *NEW 3mm corner radius to top and bottom profile edges. 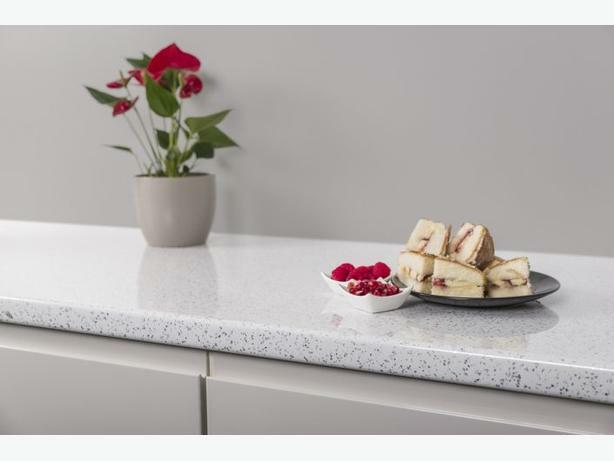 *The decorative laminate is wrapped under the worktop to provide a drip barrier against water ingress. *The rear edge of the worktop is sealed against moisture ingress with an injected hot melt wax. *A resin impregnated foil is applied to the underside of the worktop to offer additional moisture resistance. *The substrate is a high density chipboard E1 manufactured to EN312/2003 part 3 P2 grade. *A rebate with a polyurethane resin infill acts as an additional moisture barrier.